This badge was issued to Emin Atac on 05 Apr 2017. 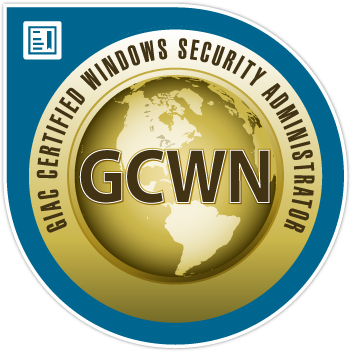 GCWN holders have demonstrated the knowledge, skills and abilities to secure Microsoft Windows clients and servers, including technologies such as PKI, IPSec, Dynamic Access Control, Group Policy, RADIUS, BitLocker, and PowerShell. Professionals holding the GCWN are qualified to install, configure, and secure Microsoft Windows clients and servers.